I am preparing a basic level book for phonics. We will be trying it out on the nursery kids of Fountainhead Global School. For each phonics sound the book will have a rhyme, a set of words with high resolution pictures, a story and a worksheet. This is based on the CCE pattern and includes formative and summative assessment activities. 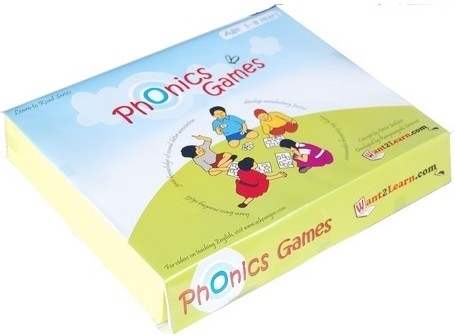 The nursery kids at the school are also getting a box of phonics games. They will play it in school as well as at home for extra practice. The phonics games were based on an idea by Greta Jackson, a British expert in the teaching of reading. Dr. Ranganayaki Srinivas has developed the phonics games. The phonics games provide systematic practice based on the phonics method. While playing the games children learn to associate the letters with the sounds they stand for. Children begin to read and guess the pronunciation of words based on the sound-letter association. Teachers can consolidate the teaching of phonics by involving the children in an enjoyable, interactive activity based on picture cards. Each game has four boards and 24 picture cards. The picture cards are to be placed on the appropriate boards to complete the game. Children in groups of 4 or 5 can play the games. Some groups play cooperatively helping each other and some groups play competitively. Children are allowed to device their own rules to play the games. There are four series of games, each with a different focus. The A series focuses on the basic consonants. There are 8 games in the set and about 40 children can play the games working in groups of 5. The B series focuses on C-V-C words. There are 4 games and about 20 children can play in groups of 5. Set A has a letter printed in the middle of the board while set B, C and D have words printed on the boards. The C series focuses on double vowels. There are 4 games. The D series focuses on other digraphs and has 4 games. I am Dr. Ranganayaki Srinivas, an ESL specialist, a teacher educator and a webinar expert. I conduct workshops for teachers through webinars and personal contact on a regular basis. You can get more information about me at http://www.google.com/profiles/rangoo#about. I would like to inform you about an innovative product I have developed with a British expert in the teaching of reading. We have launched a set of phonics games that are useful at the nursery and primary level. There are 20 games that give systematic practice based on the phonics system. The games have been tested in schools for over two years. The children taught through the phonics method have been found to read better and spell better. Each game set has 6 boards and 24 picture cards. The complete set has 80 boards and 480 picture cards. If you have any questions, please write to me at rangoo AT askrangoo.com or rangoo AT gmail.com. Please feel free to share my email with your teachers if they would like to contact me.